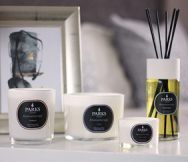 We carefully select all natural essential oils for our candles, which combine to create a unique scent which not only smells aromatic, but influences the ambiance and energy within your home. The scents we have chosen for our Rejuvenating candle will refresh, restore and revitalise you. Orange essential oil helps to banish negative energies and emotions such as anxiety, anger and depression, leaving you feeling calm and relaxed. The refreshing and revitalising scent of orange can help to promote mental stability. In aromatherapy, the refreshing scent of basil is often used to combat stress, mental fatigue and nervous tension. The calming influence of basil essential oil can provide spiritual strength and clarity when this candle is burned. Cedarwood essential oil is known for its soothing and calming effect on the mind, as it helps to relieve tension and anxiety. It can also promote healthy and relaxed sleep, which is why many people choose to scent their bedrooms and other relaxing spaces with cedarwood. Black pepper adds a depth and spice to this candle, bringing all of the scents together to create a fresh, rejuvenating aroma. Our rejuvenating candle also makes a luxurious and attractive ornament, and burns with a soft flame that enhances the ambiance of your home.